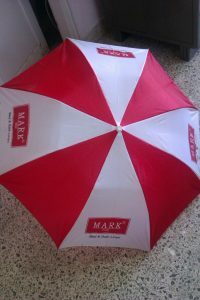 An umbrella or parasol is a folding canopy supported by metal ribs, which is mounted on a wooden, metal or plastic pole. It is designed to protect a person against rain or sunlight. Umbrellas and parasols are primarily hand-held portable devices sized for personal use. 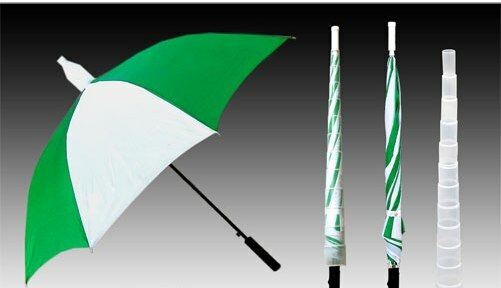 The largest hand-portable umbrellas are golf umbrellas. 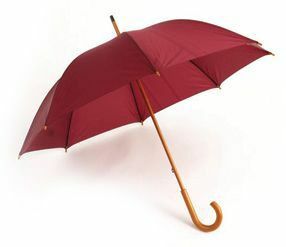 Umbrellas can be divided into two categories: fully collapsible umbrellas, in which the metal pole supporting the canopy retracts, making the umbrella small enough to fit in a purse, and non-collapsible umbrellas in which the support pole cannot retract; only the canopy can be collapsed. Another distinction can be made between manually operated umbrellas and spring-loaded automatic umbrellas which spring open at the press of a button. 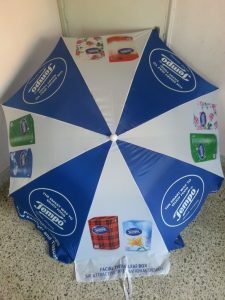 We manufacture umbrellas like Promotional Umbrella, Digital Printed Umbrella, Screen Printed Umbrella, Advertising Umbrella, Two Fold Umbrella, Compact Umbrella, Mini Umbrella, Wooden Umbrella, Square Umbrella, Business Promotion Umbrella, Political Campaigning Umbrella, Golf Umbrella, Men’s Umbrella, Gents Umbrella, Black Umbrella, Silver Coated Umbrella, Ladies Umbrella, Fashion Umbrella, Designer Umbrella , Customized Umbrella, Cheap Umbrella, Plastic Cap Umbrella, Pharmaceutical Umbrella, Anti Drip Umbrella, Golf Umbrella, Garden Umbrella, Beach Umbrella, Outdoor Advertising Umbrella, Large Umbrella, Customized Garden Umbrella, Radio Mirchi Umbrella, 98.3 FM Umbrella, Digital Printed Garden Umbrella, Digital Printed Beach Umbrella.